I was through visiting Glasgow at the weekend and made my way to Tramway. One of the exhibitions that was on display was Florian Hecker’s Synopsis. 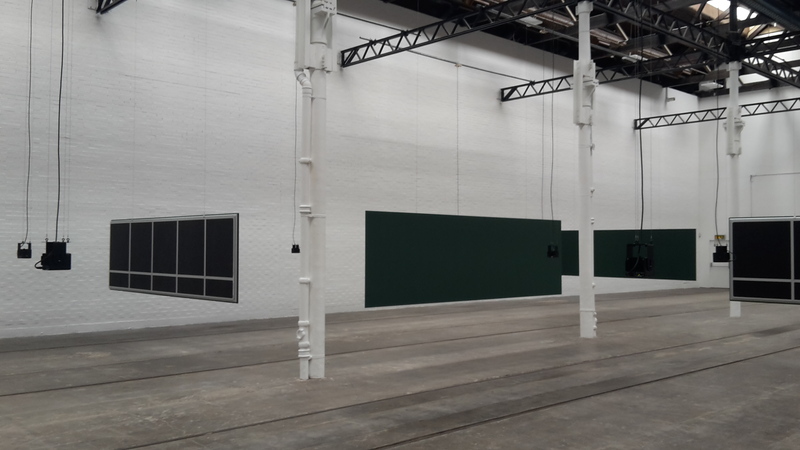 Installed in the amazing open space of what used to be the tram terminus, depot and factory, where railway lines still run through the ground, this installation is experiential to say the least. This is what I have come to find appeals to me about Contemporary Art. Whereas Modern Art and the Renaissance works are aesthetically appealing and visually rich, I feel the emotive response is quite limited. You can love a Monet, adore a Piccasso or hate Kandinsky (I would like to clarify I am not speaking from a personal perspective here, I myself love the lyricism and colours of Kandinsky’s work). However, through my explorations and exhibition visits, I have come to find that it is the experience of the contemporary which I am drawn to. Sensory works that adopt more of a physical manifestation, such as audio or performance for example, are therefore interesting to me. I think this is due to the risk-element in art forms such as this. Whereas a painting can be satisfying and pleasing to the eye, it can very rarely be an obtrusive structure which warrants specific navigation of the room. Paintings hang safely on walls; you do not touch, you simply look. Sculptures on the other hand intervene with the space, video projections force you to move in certain directions so as to avoid shadow obstructions, video noise interferes and distracts. Your senses are challenged; you are not simply looking – you are thinking, critiquing. You are engaged. Putting on headphones to listen to a work, bending low to see the underbelly of a sculpture; these movements in themselves are performative and Contemporary Art encourages the view to transform from a passive spectator into an active participant. Hecker’s installation, Synopsis, is a challenge to the viewer. Upon entering the room, the audio penetrates your very core, resonating in your chest as you feel the bass of the work swelling up inside you. The installation is composed of a conglomeration of sounds bombarding you simultaneously. These are technically manipulated and reverberate through the installation, which is composed of suspended loudspeakers, cables and acoustic panels, each detailing a different audio environment. Each sound piece presents a manipulated version of an original sound work, which is then played back simultaneously as one from the several hanging speakers, creating an immersive experience for the viewer. Now this may not be to everybody’s taste, but for me it was an interesting paradoxical experience of at once being overwhelmed by the excess of sounds yet simultaneously calmed by it. If I shut my eyes, I felt incredibly serene despite the pulsating rhythms. Navigating myself through the work at odd intervals added to this feeling of serenity, as if I stood close to a speaker, I was able to focus purely on that sound and drown out the others slightly. One sound which stood out for me in amongst the cascade of noise appeared to be that of a rhythmic heartbeat. Why I was drawn to this sound in particular, I can only assume, is because I was drawn to the human element in amongst an excess of the technological. I may be mistaken in my assumption of it being a heartbeat, perhaps that was my ears attempting to make a categorisation of the sound, which included the following: cars starting, an organ playing, heart pumping, train driving, air bed deflating, key board playing. These were the sounds my ears conjured up in the technologically manipulated landscape. It’s quite a contradiction in that I have photographed a sound work. Obviously, this is not accurate documentation at all. Whereas the installation installed moments of nervousness and a constant sense of momentum through the sound, the images do no such thing. They are flat and banal. They do however give some indication as to the environment and setting of the work. Although the experience and sensory components are what I love about Contemporary Art, they are also the highly problematic grey areas. The documents are not always able to – there are of course exceptions – accurately record an event. I would therefore highly recommend you visit this show and experience it for yourself!